This consultant’s business pack contains a collection of legal documents and statements for use when setting up a website to supply consultancy services as well as various helpful guidance documents for someone setting up a new business. 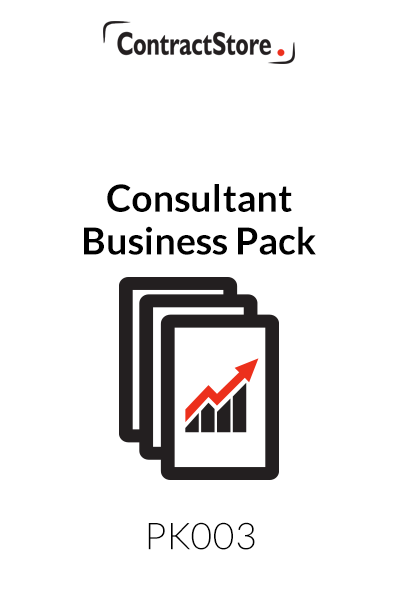 The pack is suitable for a wide range of consulting businesses. A Confidentiality Agreement. This is suitable for use when you begin negotiation with a potential business partner to develop your idea, and it can be used with your website designer. Notes on Preparing a Business Plan. 19 pages of useful notes prepared by an accountant explaining how to put your Business Plan together. Consultant Standard Terms of Business. Designed as a set of standard terms for use by a consultant when submitting a proposal to a client, as well as when entering into a contract with the client, these terms can be used by a wide range of consulting firms, from engineers to public relations consultants. They are written in clear English and easy to read and understand. Confirmation of Order for Services. This one page form is designed for use when confirming an order for services to a client. Appointment of Individual. 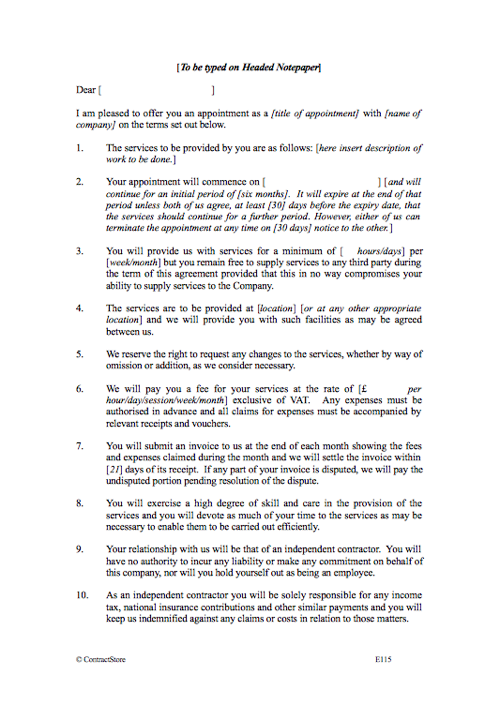 This letter of appointment is suitable for a wide range of appointments- and can be used by a consultant who takes on other people in their business – either to work as part of the consultant’s team in dealing with clients or providing supporting services, e.g. as a bookkeeper. In addition there are some useful advisory notes, especially for anyone setting up a new business, and these include a Guide to Starting a Business, a Checklist for a Shareholders Agreement and Explanatory Notes on Employment Contracts. Use this document if you want to appoint an individual on a part-time, self-employed basis, and want clarity on the terms governing your relationship. These Terms of Business are for professional consultants and freelance agents, and offer a standard set of terms and conditions for dealing with clients. Designed as a template for use by a consultant when submitting a proposal to a client, these terms could be used by a wide range of consulting firms, from engineers to PR consultants. This document has recently been updated to include an Appointment Letter to clients and a Schedule detailing the scope of services, fees and expenses payable. You may also want to look at our Consultant’s Legal Pack, which contains a low-cost collection of legal template documents that would be useful to a consultancy business. This Confidentiality Agreement is for two parties who are interested in working together to develop a new idea or new product. This agreement is designed to give protection to both parties in the development phase of the project where information is exchanged. The agreement allows either party to withdraw from negotiations after a specified period. This is sometimes known as a Non-Disclosure Agreement. Did you know that under English law you must display certain information about your business on your website? This document can help your business comply with the Companies Act 2006 and Electronic Commerce Regulations (EC Directive) 2002 and the EU Regulations relating to Alternative Dispute Resolution. You need this document if your business uses the internet or email to communicate with colleagues or clients, and you want a clear, straightforward website and email policy. This Confirmation of Order Form is for use by a Supplier to confirm an order for the supply of services. This is a one page document in Word format for a supplier to adapt for their own use when confirming or acknowledging an order. A sample form is also provided to guide you in completing the document. This is a PDF Pamphlet on Starting a Business – with Legal Tips from ContractStore’s legal experts. It introduces what you need to know for setting up – taxes, company structure, naming your business, and of course the legal documents and info that you need to put in place to establish your company. This free 24-page document, supplied to ContractStore by Cantium Consulting Ltd will help you with the preparation of a Business Plan. This free document goes in detail through the matters you need to consider when drawing up a Shareholder’s Agreement. It fits closely with our Shareholder’s Agreement contract template but it will be useful to anyone drawing up such an agreement from ContractStore or elsewhere. The Agency Agreement was absolutely spot on for my needs, with a professional layout, optional sections, clear and concise explanatory notes to fill out tailored document. I have subsequently come back to the ContractStore for Non disclosure / Confidentiality agreements for new international suppliers.